Hollywood studios are increasingly pushing digital movie purchases as a way to make up for lost DVD sales. But consumers are showing less and less interest in owning movies, particularly in digital formats. 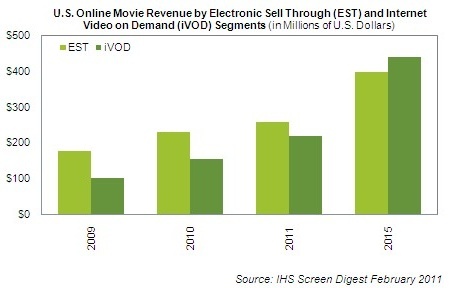 The latest evidence for this comes from iSuppli’s Screen Digest, which forecasts that Internet video on demand (iVOD) sales will surpass revenues from electronic sell-through (EST) by 2013. The research firm expects that online rentals will increase to $341.7 million in 2013, which will be up 120 percent from $155.2 million in 2010. But digital purchases will only grow 43.6 percent during that time, from $230.6 million in 2010 to $331.1 million in 2013. Screen Digest expects iVOD to continue to outpace EST through 2015, when rentals will grow to $439.1 million, compared to $396.8 million for digital movie purchases. The forecast merely follows the trend of viewer interest in renting content rather than owning it, especially for movies that are being delivered over connected devices like the Apple (s AAPL) TV or Microsoft’s (s MSFT) Xbox 360. Apple, for instance, moved to a streaming rental model when it released the latest version of its broadband set-top box last year. Apple held strong to its 55 percent market share for digital movie rentals in 2010, while its digital sales business was eroded by increased competition. The trend is even more alarming when you consider that digital rentals generally cost around $5 each, compared to $15-$20 for a digital movie purchase. That means that consumers can rent up to four movies for every one title they choose to purchase. In addition to the high price of ownership, digital movie sales suffer from the inconvenience of the current model, which generally requires users to download videos without being able to transfer them between devices. Hollywood studios are trying to remedy this model with the introduction of a digital rights locker that would allow consumers to buy a piece of content once and have their ownership stored in the cloud. The Digital Entertainment Content Ecosystem (DECE)’s Ultraviolet digital rights framework seeks to allow them to buy a piece of content once and stream it on multiple devices. But the introduction of that framework, scheduled for later this year, may come too late in light of the rapid adoption of on-demand video viewing. These numbers don’t include online video subscription services, like Netflix, (s NFLX) which offers access to more than 20,000 digital streaming titles for as little as $7.99. Netflix reported more than $2 billion in 2010 and ended more than 20 million subscribers. Makes sense to me. I almost never watch a movie more than one time anyway. It’s good to have the flexibility, though. Sites that sell/host online videos should definitely have multiple formats. Netflix sort-of does, even though its streaming offerings are still a little weak. http://Www.fargotube.com is another. I think it can be said that people find very little value in actually “owning” a movie anymore. I used to buy loads of movies a decade ago but anymore it takes a very special title to get me to buy. Ten years ago this was not the case; 10 years ago my dollars could be spent on going to the theater, buying a DVD, renting a DVD or buying a CD and that was about it. Flash forward to 2011 and now I can still do those 4 things with my dollars -or- get Netflix DVD’s by mail, stream from Netflix, rent a movie from Amazon, buy songs on itunes, go to a Redbox, watch movies and TV on my phone, watch OTT television, etc, etc.